Life is hard, and a person has to be resilient. The one certain thing that never changes in life, is change. We are either moving forward or backward in our personal growth, we never are standing still. Our situation, behaviour, and lives are always changing, sometimes for the good, or not. Life is easier if I can find a way to accept, adapt and even welcome change. The events that take place in life can feel very unfair, lucky, charmed, or just plain ruined, due to choices made, or circumstances that are beyond our control, and often, we are left with many questions, as to why this or that has happened, and wondering what the heck is going on, and what it all means. In the Mythic Wheel of Fortune, this Major Arcana card speaks directly to this. The three women, the Moirai, are standing at the womb, and the tomb. These women represent the lunar phases, crescent, full, and dark, also symbolize the three stages of life, youth, middle and old age. They are performing different tasks relating to our lives, past, present and future. Whatever happens in life, we can choose to believe that there is an orderly plan behind it all. If we choose to believe that these random events are not related to the idea of the 'Other' within our own psyche, it is difficult to make any sense of life, and can leave one feeling hopeless, and possibly bitter, looking for someone to blame. 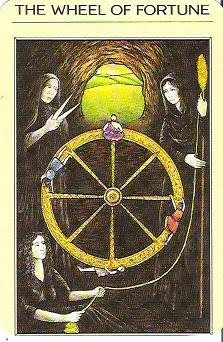 Regardless, the Wheel of Fortune heralds our inner journey, that brings growth, and creative change. There is a new phase in life, when we can create our own destiny, and a living a life we love. My philosophy of life is to strive to be honest with myself, and with others, to keep an open mind, and to have a willingness to be willing. This approach enables me to feel confident in what the Moirai on the Wheel of Fortune have in store for me. If I change my mind, I am certain my misery will be refunded. 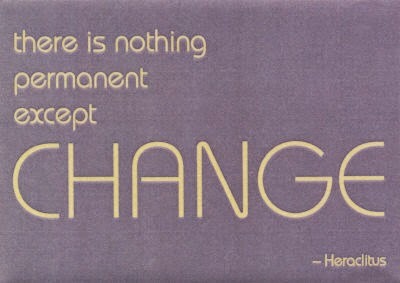 Impermanence is the constant transformation of things. Without impermanence, there can be no life. I used to fear change, thinking my security depended on everything being set in concrete. One of the best things that ever came from doing a fourth step was seeing my habitual patterns. I realized these behaviors were at the root of so many of my problems, and change was the answer to all of them. That's good stuff Bev. I think a lot of us feel fearful of change. Fortunately human beings are pretty adaptable once they can let go of our fear, and we find ourselves happy. It's a real good point to see it that way, that without impermanence there would be no life.